The great outdoors in Northern Michigan is just spectacular. In the Boyne City, the great outdoors is great indeed. So many choices....where to start? 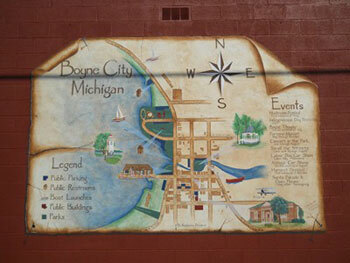 Boyne City is located on Lake Charlevoix so jump in the lake! Swimming, boating, sailing, kayaking, paddleboarding and more are perfect on Lake Charlevoix. In the winter, ice fishing and ice boating are popular frozen activities. Biking and hiking on the many area trails or roads take place nearly year 'round in the Boyne City area. Golf? Oh, yes. Avalanche Mountain in Boyne City is the place for winter fun with skiing, sledding, and skating as well as hiking when the snow melts. Winter sports are spectacular with nearby Boyne Mountain. World class skiing and boarding along with a snowsports school and a ski village with dining and activities await winter lovers. Cross country skiers and snowshoers can explore trails galore in the Boyne City and Charlevoix area.